Today I believe it is very rare indeed to find a craftsman that works on producing these fantastic works of true useable art. There may be one or two in the United States and only a few that I know of in Europe that carve Springerle molds. Please look for the links to those that I know. The general consensus from what I have found is that Springerle were first made in German speaking Europe, mainly Southern Germany, the Alsace region of France and parts of Switzerland. Springerle molds were made from clay, wood and metal. Many of the ancient molds that have survived can be found in European museums and in private collections. There are a few collections in America as well. On this site you will be able to view some of the molds from the Mildred Jenson collection. The origin of the Springerle name seems to be attributed to the fact that many of the first molds were of horses and their riders. Also, that some Springerle cookies seems to "spring up", when baked. There are dimensions formed as the cookie bakes, with the top "springing up" from the base. Biblical scenes were some of the earliest images portrayed in Springerle. Other scenes soon followed that reflected daily life, such as holidays, births, weddings, engagements, country living, gardening, etc. Springerle impressions have been used for centuries as tellers of tales, educational media, betrothal tokens between lovers and also just the pure enjoyment of everyday living. Today it is very rare indeed to find a craftsman that works on producing these fantastic works of true useable art. 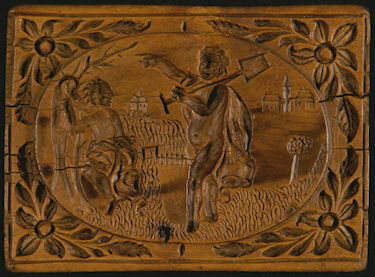 There may be one or two in the United States and only one that we know of in Europe that carve Springerle molds. The general consensus from what we have found is that Springerle were first made in German speaking Europe, mainly Switzerland, Germany, and parts of France. The first designs for molds were created from clay in about the 16 th century. From there, wood became the medium for molds and other materials such as metal followed after that. Many of the ancient molds that have survived can be found in European museums and in private collections. There are a few collections in America as well, and the hobby of collecting Springerle is growing. The origin of the Springerle name seems to be attributed to the fact that many of the first molds were of horses and their riders. Also, the fact that the cookies seems to "spring up." There are dimensions formed as the cookie bakes, with the top "springing up" from the base. Springerle impressions have been used for centuries as tellers of tales, educational media and betrothal tokens between lovers. This mold dates to the 1700's and was probably in the possession of a Swabian Baker's shop. I'm of the belief that the two figures are early horticulturists. The oval image is raised slightly from the border. This is a fine representation of a Springerle mold that has lasted a few centuries. It is showing it's age with splits in the wood but these do not detract from the beauty of this mold.